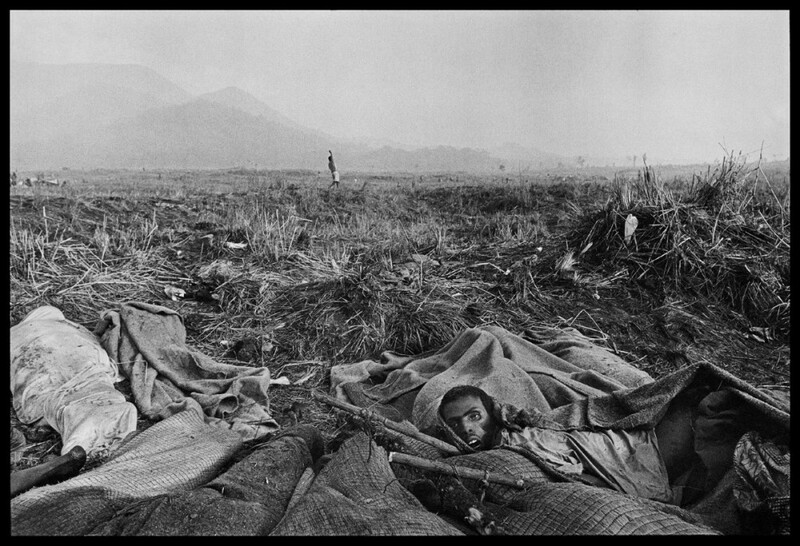 War is a huge, infernal industry, the largest one on this planet. It seems presumptuous for one man to attempt to stand in the way of this machinery. Once war has broken out, everything spirals out of control almost immediately, turning even the armies and the soldiers who fight in it into helpless onlookers, victims of their own hubris. We are totally at a loss to explain the photographer’s attendance here. How could he make himself invisible like this? That’s exactly what makes them so very powerful. It’s almost like trying to square the circle if you want to dissociate yourself from what an image presents and conveys, let alone try and tell the opposite of what it shows. All right then, imagine just this: You want to change the life of ONE person with a photograph. That alone is an enormous challenge, if you think about it. “Wait a minute!” you may object. “Perhaps he gets a kick out of this going-to-war thing, or maybe he is some kind of thrill-seeking tourist. After all, there are people who climb up skyscrapers or walk tightropes at dizzy heights or hurl themselves out of planes or jump off bridges—things which none of us would do, but which a few others apparently like to do. Couldn’t Nachtwey be one of those?” If he were, he surely wouldn’t win a Peace Award, he would just win some medal as an action hero. 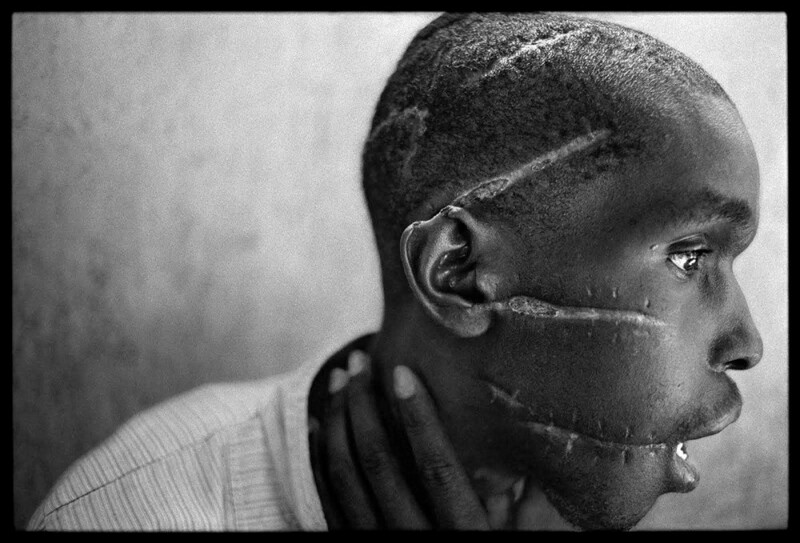 This James Nachtwey may have the same first name, but he certainly isn’t a James Bond type. Who is he then? There are a thousand signals and messages arriving simultaneously, all of which have to be processed within a fraction of a second. But that’s exactly why the photographer has to be just as precise, quick, careful, considerate and dependable as if he were at a wedding or on a red carpet. No, that’s not true: he has to be even more precise, quicker, more careful, more considerate and more dependable. In war, often enough, you don’t get a second chance. I believe that all we really have to do is take a closer look. All we have to do is train our eyes to see not just the PHOTOGRAPH itself, but the ATTITUDE of the eye and the heart that took it. Every look represents a certain attitude or state of mind, your gaze just as well, at any given time. Interest, boredom, disgust, indifference, sorrow, love, surprise, curiosity, hatred, cynicism, affection, respect, aversion, exhaustion, frustration…whatever guides our eyes is depicted along with the subject when a camera is lifted to the eye. There is no picture that wasn’t taken with an attitude of some kind or other. The photograph invokes what may happen next or what might just have happened. Whichever the case, these children will remember this moment as long as they live. The caption that I’m turning to, after I have tried to decode the picture myself for a long time, says: “El Salvador, 1984. The army evacuates wounded soldiers from a village football field.” Well, this explains it a bit. Still the message of any photograph is only the photograph itself. In museums, you might have noticed, many people pounce on to the caption, before they even look at the picture. It’s as if they were trying to protect themselves from the image. Reading creates distance, you’re not really concerned any more, the information lets you stand above the things that might otherwise trouble you. YOU MIGHT ALSO LIKE: Deutsche Börse 2015, what’s the point? These are pictures by someone who has a strong desire for justice in the face of the horror unfolding right before his eyes, someone who puts a lot on the line for this. I’ll move on to another image, almost the opposite to the one before. The Balkan Wars. A Serbian infantry attack near the village of Rahic, outside Brcko, was successfully repulsed by Bosnian forces. The Serbs who where killed in action were collected from the battlefield and taken behind Bosnian lines. They were dumped in a farmyard, identified, and returned to their comrades the following day. It shows a truck unloading its horrific cargo: dead bodies are sliding down from the bed. The driver is leaning out of the window of his truck so he can see where he is dumping his load of dead men. Among the bodies there is a wheelbarrow, in a moments it will also come crashing down… The dead are all fully dressed. The way they’re sliding down the tilted surface, with their heads dangling, shows that rigor mortis hasn’t set in yet. As with most of Nachtwey’s photographs, the lens is a slight wide-angle. With such a lens, the photographer has to be right where it’s happening. To be able to take photos such as this, you have to get close to the scene. 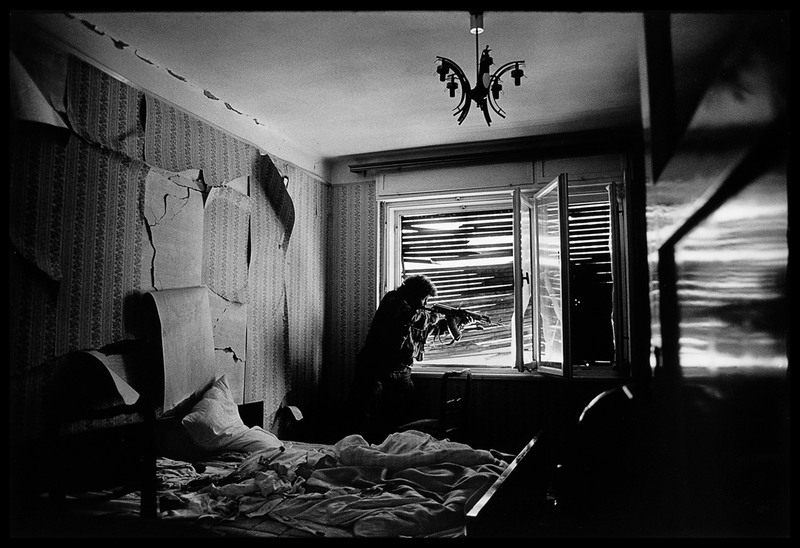 Or let us look at a third image taken during the Chechen War in the mid-nineties. A village road, a singed wooden barn in the foreground. On the snow-covered road in front of it lies a dead woman, wearing a simple winter coat. Beside her on the ground, a purse. We see the sneakers and her thick socks, her left foot strangely and unnaturally twisted. Is it broken, was she shot at? A woman who had ventured out to buy supplies was killed by a mortar shell. Her neighbour discovered her lying in the street. Actually, the act of photographing is a very lonely job. You are mostly left to your own devices, especially when war is raging around you or hunger and death are haunting the land. I am aware that the word I’m going to use is somewhat antiquated, and it’s probably difficult to translate. This man is a “Menschenfreund,” a lover of humanity, and therefore an enemy of war. And when he goes right to the heart of the war he does so on behalf of us, in order to force us to look closely, but also on behalf of the victims, as the eye-witness who wants to testify in their favor and belie war and its propaganda. 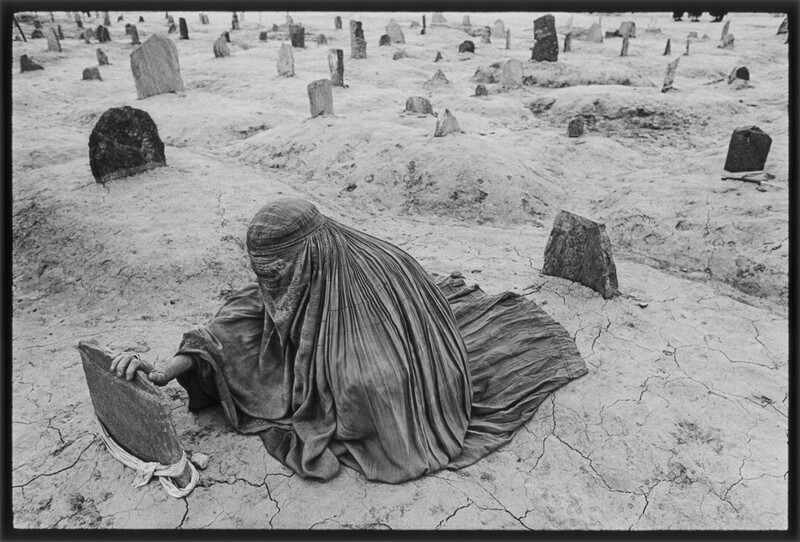 Maybe James Nachtwey is not just a photographer, but has a lot of professions. He is also sociologist who doesn’t just dutifully record the phenomena and symptoms, but who wants to understand what caused them; a minister who knows that it is not consoling that gives consolation, but most of all being there for someone else; an archeologist who doesn’t just hastily burrow down into the dirt, but who carefully uncovers stone by stone; a poet who knows that he must never name things in plain words, but only invoke them in the reader; a philosopher who’d rather encourage people to think for themselves instead of self-righteously doing the thinking for them; a teacher who commands our respect because he respects everyone, including himself; a gardener who knows that you have to get to the roots when you want to pull out the weeds; a surgeon who knows that it won’t do just to operate on the fractures, but that you have to lay bare the trauma inside. In short: a man who is able to look life and death in the eye, not because he is more courageous than we are, but because he lets himself get carried by all of those for whom he does it. 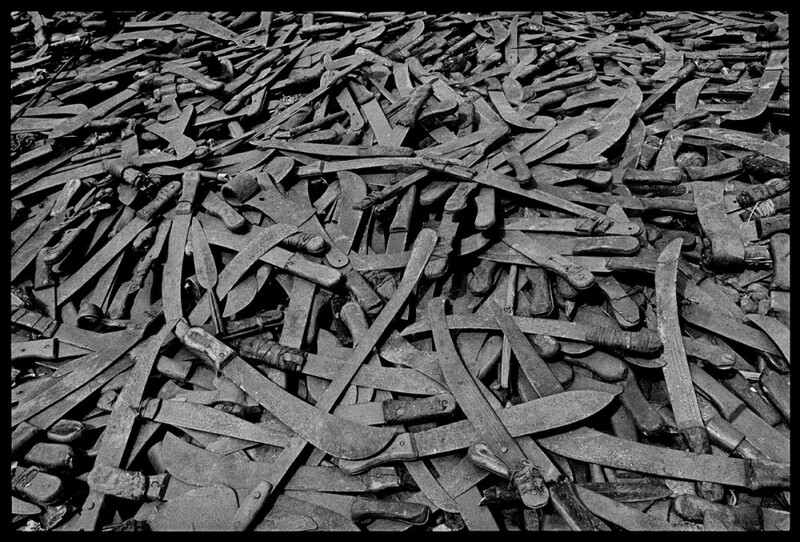 And because James Nachtwey is all of the above, because he has never stopped believing that there is reason behind his work, because he has never stopped believing that his images have their greatest possible effect only if the eye and the heart behind them have an unfailing faith in humanity and its ability for compassion. Posted in Essays and tagged Archive Highlights, Chechnya, Darfur, Dresden Museum of Military History, James Nachtwey, Rwanda, Sudan, War, War Photography, Wim Wenders.